Edward Burne-Jones’ preraphaelite tapestries have inspired the Anna Sui Spring/Summer 2014 Show. Other Edward Burne-Jones-influenced collections : Gucci by Frida Giannini Autumn/Winter 2012-2013 (this show highlighted modern versions of Edward Burne-Jones’ heroines), Oscar de la Renta Spring/Summer 2012 (images of preraphaelite beauties painted by Edward Burne-Jones were pinned on the mood board of this collection). Completely different than Rodarte, but so wearable as well. Absolutely lovely and soothing — a diverse step for me. Pretty. Makes me feel like traveling to Greece…would look lovely on anyone, too. Thank you ! That’s the wonderful power of inspiring fashion, it makes you travel in a lovely and exotic dimension (I love your “Greece” reference !). I am really drawn to that type of woman-pale, languid, suggestion of the figure rather than dressed in clothes that are 2 sizes too small, so different than the typical idea of beauty today. Love it! Thank you so much ! This vintage-inspired look is very refreshing ! this is so romantic, and the redhaired model chosen for this outfit is so perfect for it! gorgeous bohemian look! by the way, we love Anna Sui’s craftsmanship, the detailing here is so interesting! Thank you so much ! 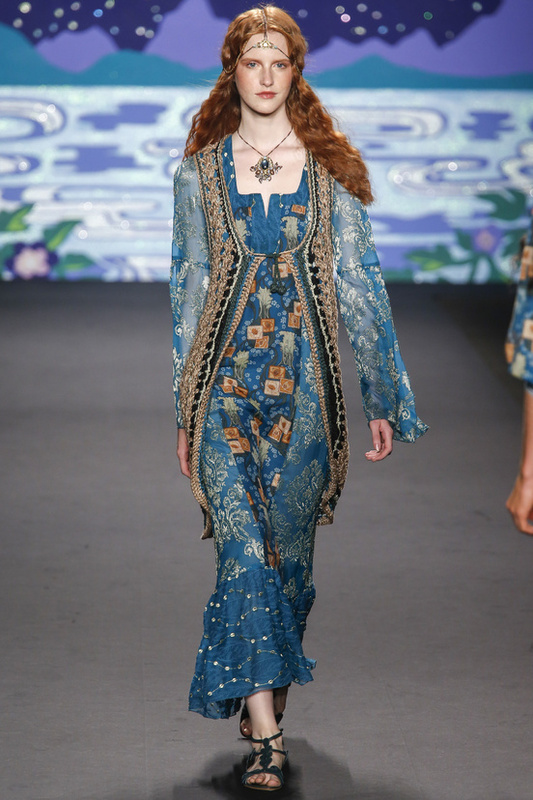 The preraphaelite masterpiece that you’ve added on your reblog beautifully highlights Anna Sui’s ethereal outfit !